Tampa Bay Buccaneers fans were treated to yet another strong first quarter from the Bucs offense, jumping out to a quick 13-0 lead behind two Jameis Winston touchdowns, one to Mike Evans and another to rookie TE O.J. Howard. The New York Giants made it a game with a 10-point run on the legs of Eli Manning, yes, the legs of Eli Manning, via a 14-yard touchdown run. The second half was more back and forth including a fourth quarter touchdowns pass from each quarterback. However, it was a Nick Folk redemption story as he made up for three missed kicks (two field goals and a PAT) with his 34-yard field goal as time expired to give the Buccaneers a 25-23 victory. With that, we give you our PFF exclusive takeaways from the contest for each team. Uneven at times, but clutch when it really mattered. There are question marks over the chemistry with DeSean Jackson, but no such issues when hooking up with Cameron Brate or Mike Evans and with the game on the line it was a picture perfect pass to Brate that put the team in position to move above .500. Winston made a series of big time throws as the Bucs picked up chunk plays, completing 10 passes that went over 10 yards in the air. If the team can give him protection, he can pick a defense apart and on the 29 plays he had a clean pocket he completed 64.3 percent of passes at 10.5 yards per attempt. It’s been a tough start to the year for Smith, with his first two efforts echoing issues he suffered from in his first two years. 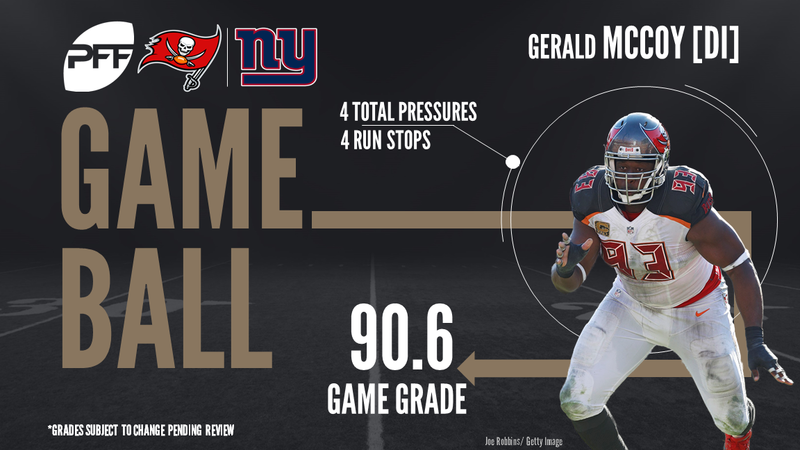 But this was a much better effort, and while the interior struggled to anchor against the Giants powerful front, Smith (and Demar Dotson) ensured Jason Pierre-Paul and Olivier Vernon had very quiet days. Smith allowed just one pressure and showed good movement skills on the running games, pulling to the second level on a number of occasions and generating good movement on contact. McCoy was a game-wrecker from the Giants opening snap. He opened the game by busting through the Giants line of scrimmage on the first two plays, both of which resulted in tackles for loss. McCoy finished the game with two hits and two hurries for a 84.6 pass-rush grade. And he was dominant against the run with four stops and a 90.5 run defense grade. With his performance today, it appears that Eli Manning is putting together a bounce-back year for the Giants. Manning completed 30 of his 49 passes but his adjusted completion percentage was hindered by five drops from Giants’ receivers and backs. Manning was especially effective in the intermediate area of the field (10-19 yards). In that range he was 8-of-13 for 103 yards. The Giants may be 0-4 but the way Harrison has started the year that is not a reflection of his efforts. He was excellent again here, generating his first two pressures of the year while delivering his usual disruptive work in the run game. He hasn’t appeared on the stat sheet as much as previous years, but his ability to shed blocks and redirect runners is really something to behold. A busy day for Jenkins as the former Ram was targeted seven times. The end result was just three completions for 27 yards, while he was able to break up two passes for good measurement (one of which he almost picked off). He did get called for a penalty and missed a tackle but Jenkins continues to play up to his big 2016 free agent deal, no matter who he is matched against.